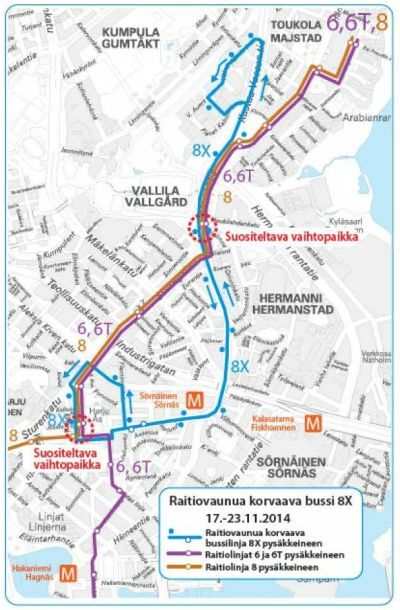 Bus 8X replaces tram routes 6 and 6T between Hakaniemi and Paavalin kirkko (St. Paul's Church) and tram 8 between Kallio Sports Hall (Kallion urheilutalo) and Paavalin kirkko from 17 to 23 November because of water main work on Päijänteentie. The work also causes changes to the timetables of trams 3 and 9. Trams 6 and 6T run from Hakaniemi via Karhupuisto, Läntinen Brahenkatu and Sturenkatu to their normal route. Buses from Hakaniemi to Arabia run along Hämeentie as usual. Tram 8 runs along Helsinginkatu, Läntinen Brahenkatu and Sturenkatu to its normal route. There are changes also to the timetables of the trams from the direction of Arabia. In the direction of Vallila, passengers can transfer from tram to bus 8X at the Urheilutalo 0259 and 0260 tram stops on Läntinen Brahenkatu and Urheilutalo 2148 bus stop. In the direction of Kallio, the transfer stops are the Paavalin kirkko bus stops 3026 and 3025 on Hämeentie and the Paavalin kirkko tram stop 0330. Bus 8X uses the following route: Helsinginkatu, Hämeentie, Kustaa Vaasan tie, Väinö Auerin katu, Kustaa Vaasan tie, Hämeentie, Helsinginkatu, Fleminginkatu, Aleksis Kiven katu, Läntinen Brahenkatu. Bus 8X stops at all bus stop along the route, with the exception of the junction of Helsinginkatu and Fleminginkatu where it stops at the tram stop. The same tickets are accepted on bus 8X as on trams, i.e. also mobile tickets and tram tickets purchased from ticket machines or with Travel Card are accepted. Also all other HSL tickets valid in Helsinki (Helsinki internal ticket, regional ticket, three-zone extended regional ticket as well as Helsinki internal and regional day tickets) are accepted on the bus. There are temporary changes to the timetables of trams 3 and 9 in effect from 17 to 23 November. On route 3, the services from Kallio Sports Hall in the direction of Nordenskiöldinkatu marked with an ‘r’ and the services from Nordenskiöldinkatu in the direction of the Olympia Terminal marked with a ‘u’ do not run. On route 9, the services marked with a ‘b’ in the direction of the West Harbor (Länsisatama) operate from the Urheilutalo stop 0260 on Läntinen Brahenkatu and the services marked with an 'n' in the direction of Pasila operate to the Urheilutalo stop 0259 on Läntinen Brahenkatu.